The SwingRite instructs with a "click" sound. The click tells the user where their hands are releasing. The click should ultimately happen in the impact zone (bottom) of the swing. This Regular Model SwingRite is 34 1/4 inches long and weighs about 17 ounces. The metal part of the SwingRite is electroless nickel plated, which helps to preserve the quality of the product. The product and made and assembled in Massachusetts. SwingRite Golf Trainer Finally! A training aid that focuses on the most important aspects of the golf swing: tempo, swing speed, hand release, and grip! The SwingRite has sold over 1 million units since 1960. YES, 1960...that would be 48 years and still going strong. If that isn't a testimonial in itself, what is? Try one today and see why this amazing training aid has stood the test of time. The SwingRite golf swing trainer can be swung indoors, or out. It's ideal for when there is no time to get out on the course or when the weather is bad. Since it can be used anywhere, at any moment, it provides a quick and easy way to reinforce muscle memory, a necessary aspect of improving and perfecting your golf swing. Because it is adjustable to swing speeds between 55 mph and 125 mph you can practice all types of swings from full swing to chip. And as any golfer knows, the only real way to improve at golf is to understand the basic principles of the swing and work on them. Features ? Set head at desired number ? Pull ring toward grip end beyond triggers as far as it will go. ? Then swing 'till you "click the club" at your imagined impact point. Tips Start at the highest setting 9, and work your way down towards the number 1 position turning the chrome head 1/2 turn at a time until you feel comfortable swinging Swing Rite and making it "CLICK" at the proper position. When you reach your desired position and can swing comfortably, that's it, you're ready to perfect your swing. HAVE FUN. FAQ's Q. Where can I practice with SwingRite training aid? A. The SwingRite can be used anywhere, indoors or out--at the driving range, in your backyard, at home, or at the office--to perfect your swing and increase your power year-round. Q. What types of shots can I practice with theSwingRite training aid? A. You can practice any type of shot, including approach shots and chip shots (see Instructions). Q. How big is this training aid? A. The Original SwingRite is approximately the size of an actual golf club without a clubhead. It is 34" long. 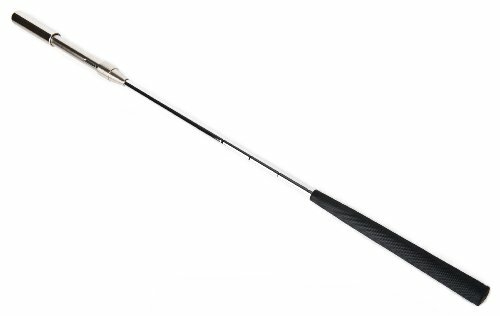 The SwingRite 2000 is a few inches longer, with a clubhead the size of a 3-wood. SwingRite 2000 has a telescopic shaft for easy travel and compact storage. Q. How do I know if my swing is correct? A. The "click" is the key to a SwingRite training program--you don't need anyone to tell you if the timing of your club release is right. With SwingRite, YOU can tell all by yourself--and adjust your swing to accomplish more power and distance. The goal is to have the Click happen at the bottom of the swing. In other words, the SwingRite should Click at impact with the imaginary ball. Q. How do I measure my progress? A. If you practice regularly with SwingRite, you will soon see your distances increase with each respective club in your bag. As you see progress, you will adjust the setting to lower numbers. This adjustment will make you swing harder in order to produce the Click, thus creating an ever more powerful swing. Q. How far should I be hitting? A. In still conditions, a male golfer should hit 120-140 yards with his 7-iron, 155-180 with his 3-iron, and even farther with his driver. The difference between the white and the ladies' tees is from 30 to 100+ yards at most courses (par 3s to par 5s), so women generally figure their maximum distance to be lower than men's according to similar parameters.